Welcome to Saraf Public School, a leading K-12 co-educational school established in 1992. Saraf Public School offers strong educational opportunities in Khatima. 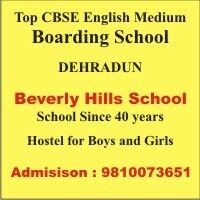 Strategically located in one of the most important towns of Udham Singh Nagar district of Uttarakhand, the school has top-notch faculty and facilities. Founders at Saraf Public School believed in education as a facilitator of social mobility, wanted to establish the school as an entirely new kind: a school that would be at the heart of the exciting proposition – Academic Excellence. Saraf Public School today, proud inheritor of these traditions, has evolved into just that. Each year several of our pupils are accepted by the leading institutions and universities. Pupils proceed from Saraf Public School to the most competitive higher educational institutions across the country. Saraf Public School believes that at a great school it is not just knowledge that is acquired but the ‘arts and habits’ that last for a lifetime. Grounded in the values of academic excellence, Saraf Public School strives to maintain an appropriate balance among its courses and activities. The School treats students as individuals and respects their unique strengths, while offering the most rigorous academic program possible and as a result also have a long standing reputation for producing some of the finest citizens who have contributed significantly to the development of the country.